Padova, Italy – To promote collaboration on some of the biggest challenges facing agriculture today, the University of Georgia College of Agricultural and Environmental Sciences is partnering with the University of Padova in Italy for a groundbreaking dual master’s degree program in sustainable agriculture. 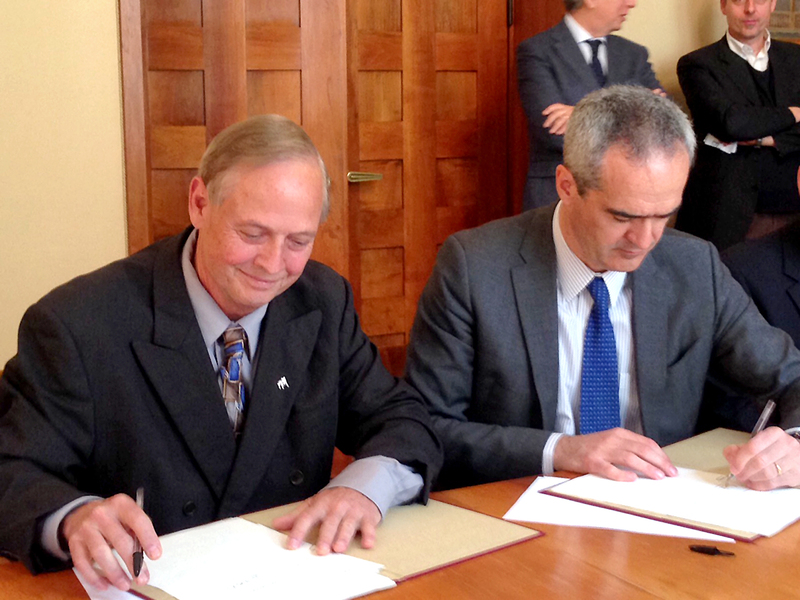 On May 3, administrators and faculty from the University of Padova and UGA met in Padova, a city in northern Italy about 24 miles west of Venice, to sign a memorandum of understanding finalizing the dual-degree program. The first students will be enrolled this fall. Both the University of Padova, which is the top-ranked agricultural university in Italy, and UGA, which houses one of the best colleges of agriculture in the U.S., are leaders in precision and sustainable agriculture. The dual-degree program, housed in the department of crop and soil sciences at UGA, is the first of its kind in the college. The challenges facing agriculture in the 21st century are global and won’t be solved by scientists from a single country or continent, said George Vellidis, a UGA professor of crop and soil sciences who spearheaded the effort to develop the program. Students who choose the dual-degree program at UGA will complete most of their coursework in Athens during year one and then travel to Italy for one or two more courses and to conduct their master’s thesis research during year two. Students beginning at the University of Padova will complete most of their coursework in Padova and then travel to Georgia to complete their master’s thesis research and take one or two courses at UGA. To participate in the dual-degree program and receive degrees from both universities, students must be admitted to both institutions and fulfill all graduation requirements at both universities. The dual degree is being offered as part of a new sustainable agriculture emphasis area within the existing master’s degree in crop and soil sciences. Students wishing to pursue the sustainable agriculture emphasis area can choose to either participate in the dual-degree program or take all of their courses at UGA. The dual degree is the maturation of a 12-year partnership between UGA, the University of Padova and four other European and U.S. universities. Together, these schools formed the TransAtlantic Precision Agriculture Consortium in 2004. Precision agriculture is an agricultural management strategy that helps increase the efficiency and sustainability of food production by using advanced technologies to strategically deliver water, fertilizer and other inputs to crops. When viewed from the food security perspective, optimal use of crop inputs ensures that resources are used as efficiently as possible. Since its inception, the TAPAC partners have exchanged 45 undergraduate students and eight graduate students. This semester, Dory Franklin, an associate professor in the crop and soil sciences department, is teaching UGA and University of Padova students while in Padova. Funding for these activities has been provided by the USDA National Institute of Food and Agriculture’s International Science and Education program, the U.S. Department of Education, the European Commission, the University of Padova and UGA. For more information on the program, visit http://vellidis.org/teaching/dual-degree-uga-padova/. For a full timeline of its development or more information about the application process, visit http://grad.uga.edu/index.php/current-students/policies-procedures/academics/degree-programs/5119/crop-and-soil-sciences-ms/.